It's getting harder to tell the police from the criminals in some areas. Of course, this is Illinois. CHICAGO — The reputation of an Illinois policeman said to have staged his suicide to look like he was murdered eroded further on Friday with the release of personnel files showing complaints of sexual harassment, drunkenness and abuse of power. Lt. Charles Joseph Gliniewicz, a 30-year veteran of the police force in the northern Illinois town of Fox Lake, was lauded by politicians and buried with honors after he was found dead on Sept. 1, apparently killed by suspects he was pursuing near a marshy area. But this week investigators revealed the 52-year-old had committed suicide over an audit he feared would expose his embezzlement of funds from a youth program, making it look as though he was killed in the line of duty possibly to preserve benefits for his family. 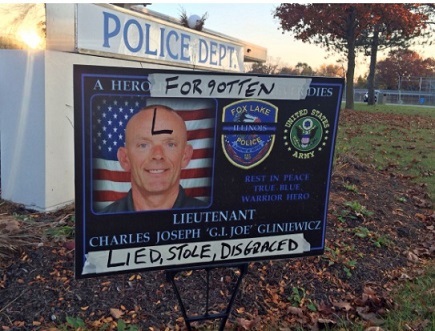 Fox Lake officials released Gliniewicz’s personnel files on Friday, showing a dual history. On the one hand they showed years of leadership, commendations, positive reviews and promotions. On the other, suspensions and written reprimands for a variety of problems, ranging from being late for work to improper use of work computers and missing meetings.